Astrology is a framework for mindfulness and magic. I use astrology to enhance self awareness and to craft intention using the wisdom of the earth and sky. Awareness and intention are the bedrock of mindfulness and magic. Mindfulness practices, like astrology or meditation, help awaken our ability to notice. These practices don’t have to be mysterious. They can be as ordinary as remembering to pause and take stock of what is going on around us. Ellen Langer, a social psychologist, professor and writer on mindfulness likes to demystify this state of mind. She said this in an interview with Krista Tippett on her show, On Being: “And so, mindfulness, for me, is the very simple process of actively noticing new things. When you actively notice new things that puts you in the present, makes you sensitive to context.” The seasons (signs), planetary cycles, and elements of astrology are ample tools for noticing new things. Daniel Siegel, another mindfulness expert, writes that meditation practice helps to enhance natural open curiosity about life. We become less fixated, more capable of wonder. Curiosity is a powerful antidote for toxic certainty. Open curiosity is where I want to land at the end of the current Aquarius lunar cycle. The mind has been a prime subject of this the current lunar cycle,* which began on January 21 at zero degrees Aquarius. For the last three weeks I’ve written about the influence of Mercury retrograding through Aquarius, bringing attention to our thought processes. Thoughts are like ice, sometimes slippery but also able to crystalize into forms that help us solve problems. As the fixed air sign, Aquarius entices us with mental constructs that promise to fix our problems. But we need to be careful about putting all our eggs into one elemental basket. Fixed signs can be so single-minded that they forget that there are other approaches. Air is only one of the elements.We’ve had a lot of opportunity to become more aware of our thought patterns during this cycle, but we’ve also been dancing with emotional awareness (water) during this lunar cycle. The planets in Pisces right now remind us there is more to consider than the rational side of things. As we finish this lunar cycle, what revelations have you had about thought processes? I hope you’ve had the opportunity to notice new things about yours. It isn’t too late. As Mercury cleans up its messes from now to March 4, when it finally clears the retrograde zone, take the opportunity to notice, with open curiosity, your own thought patterns. We will soon leave Aquarian air behind. The focus will turn to the intuitive/instinctual realms this next lunar cycle as we enter Piscean waters mixed with Aries fire. Venus and Mars ingress into fire sign Aries together this coming week, setting off fireworks. Fire is reactive and instinctual. A favorite description comes from my friend, Heather Roan Robbins. She describes Aries’ motto as, “Ready, Fire, Aim.” Under this influence, we are quick to act, but not so prone to think about it first. This is all part of the journey of active noticing, and endless fodder for bemused observation. What are you seeing? February 15—Balsamic Moon: Surrendering. Some of the final wisdom of this Aquarian lunar cycle comes today in the form of noticing internal and external critics. The influence of the Moon in Capricorn is to plant our feet firmly on the earth, with an eye for evaluating how far we’ve come and how far we have left to go. Capricorn and Aquarius (the sign influencing our intentions for this lunar cycle) have an uneasy relationship. As long as these signs can keep things objective and dispassionate, Aquarius appreciates Capricorn’s wisdom. But if for a moment, Aquarius feels that Capricorn wants to make Aquarius follow the rules, their collaboration can fall apart. Information from the past, from elders or experts, and with an eye on mastery, comes our way today. How easy is it for you to surrender your rebel stance to hear this wisdom? Letting ourselves pause before displaying outrage over feedback could serve the long-range vision. The Moon triggers the Uranus/Pluto square. Pluto has been transforming Capricorn since 2008. Exposed in this transformation has been all the ways we oppress ourselves and all the ways we’ve been oppressed by others. If the Aquarian lunar cycle has reawakened your passion for rebellion, it may be difficult to sit still today. This phase of the Moon reminds us to include mystery and paradox in our toolboxes for change. Monday, February 16. The influence of Venus and Mars is strong this week. Right now, these two planets are almost conjunct at the end of Pisces. The exact conjunction (at 1 degree Aries on February 21) could set off fireworks of passion. After all, Venus and Mars represent the classic pair of lovers. Venus is the enticer; Mars the pursuer. Venus invites us to experience pleasures more deeply. Mars drives our wills and passions. When these two energies conjoin, there is little reservation. We know what we like and we know what we want. Right now, pleasure and desire wear opalescent colors of Pisces. In a few days, the costume for the lovers will be designed by fiery Aries. Notice what is bubbling up from your unconscious. Give yourself permission to feel what you feel. Be curious about everything. Hidden beauty and ecstatic connections are possible. When the Moon enters Aquarius this evening (CST), we get a chance to form mental constructs (words, systems, plans) informed by inspiration from the Lovers. Tuesday, February 17. Most of us are quite good at belittling our contributions. Notice when you think your efforts are unimportant or that what you do doesn’t really matter. The quincunx between Jupiter in Leo and Chiron in Pisces is calling our attention to how each of us makes a difference. We can reframe our notions of effectiveness and compassion today. The Moon’s opposition to Jupiter contributes to of seeing this pattern in a new light. February 18—New Moon: Dreaming. A unique lunar cycle begins today. 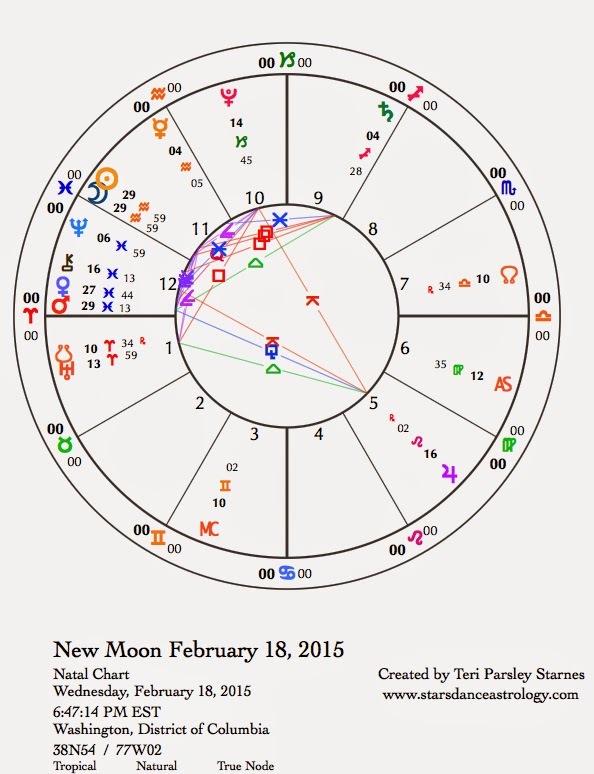 The Sun and Moon conjoin at 29 degrees Aquarius 59 minutes in the chart for this “Supermoon” New Moon. You may remember that the last lunar cycle began at zero degrees Aquarius. Today’s lunar cycle begins with only one more minute of Aquarius remaining. We couldn’t possibly be closer to the end of a sign than this. So really, this lunar cycle begins on the liminal cusp between Aquarius and Pisces. The cusp of two signs is a potent portal. We haven’t entirely left Aquarius behind nor fully entered into Pisces. Take a moment to sense into the what this feels like. Look behind and see the electric hues of Aquarius vision and look ahead into the opalescent mists of Pisces surrender. With a beginning like this, the experience of this cycle promises to be very Piscean—that is fluid and a bit mysterious. This doesn’t mean that we just get to drift into dreamland for the next four weeks. There will be many jolts this month. For one, on February 19 Mars enters Aries, the next day Venus also moves into Aries, then the day after that on February 21, Mars and Venus conjoin at 1 degree Aries. Later this lunar cycle, Venus and Mars will be triggering Uranus and Pluto on the way to this pair’s final exact square on March 16. Since 2012, when Uranus and Pluto began their series of seven exact squares, we’ve been under pressure to reveal toxicity (Pluto) in our cultural structures (Capricorn) and to awaken (Uranus) to bold action (Aries) for change. Since this is the last exact square, the transits by Venus and Mars may be more significant than usual. Both Venus and Mars can awaken passion and action. We are much less interested in being nice. Impatience is high. With that potential running through the lunar cycle it becomes even more important to skillfully use the opportunity that Pisces offers us to prepare for bold action and response. Pisces, as the mutable water sign, is more concerned with what we know from emotional cues than intellectual ones. Pisces as the last sign of the zodiacal year, represents the sum total of what we have experienced in all the ways humans can experience life. Yet Pisces also represents a transcendence beyond all that. It is a lot to hold. Few do it perfectly. Perhaps that is why Pisces can get lost in an overwhelming amount of perception, especially emotional perception. Escapism is a coping mechanism. This holds true for the collective ways of coping as much as for individuals. If we are going to use the revolutionary energy of Uranus and Pluto for useful change, it is important we learn to take care of our souls. This liminal lunar cycle that begins between revolutionary Aquarius and sensitive Pisces prepares us to be engaged in change as we learn what we need somatically to be healthy and happy. Thursday, February 19. Mercury gets help from Saturn, which means that fuzzy details can come into focus. After the recent retrograde of Mercury, we may benefit by using this energy to clarify confusion or reboot the systems in our lives. With so much information coming from hidden sources (Moon/Neptune in Pisces), it feels good to get a firm grip on knowing what we know. This lunar cycle provides opportunity for developing psychic tools. As Mars enters Aries, expect more clarity about what you want. We may all want a bit more independence. The contrary relationship between Pisces (merging) and Aries (diverging) is acutely felt today. Friday, February 20. Sometimes Venus helps to moderate any belligerence we may be feeling towards others. We can’t count on that while Venus is in Aries. However, Venus in Aries can give co-dependent relationships a healthy dose of self-reliance. When the Moon enters Aries this afternoon (CST) independence will become a virtue. Let people around you blow off steam. You may need to do so yourself. This is a great day to be active, begin projects, and generally pay attention to what you really want. Saturday, February 21. The New Moon on the cusp of Pisces began a month of sensitive opening and gentle releasing. Or so we hoped. I am inviting you to hold dual awareness: Pisces empathic connection and Aries bold individualism. This is quite a paradox but may help us as we move forward this month. Venus and Mars conjoin in Aries today, and the Moon in Aries contacts the Uranus/Pluto square. With this dual perception, we are able to see beneath the anger and the denials around us. Build your capacity to feel and to act with feeling.